1. Unloading the printer by going to the four screws. 2. Check the bar encoder. Encoder is a translator program to the printer motor movement. Normally this encoder bar gross taxable splashes of ink. 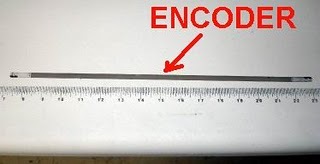 This encoder forms, such as clear plastic tape and there are lines of code. 3. Clean the encoder with wet wipes. "Look out" do not let the lines on the encoder is lost. 4. Try your printer. If still equal, the encoder must be replaced.